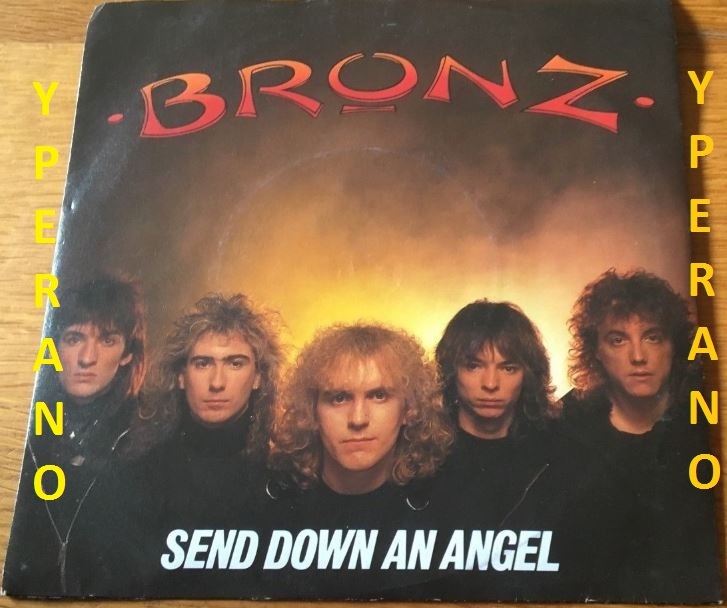 Home / Search by Media Type / NWOBHM 7" / Bronz: Send Down an Angel (U.S.A mix) edited version 7″ Great melodic N.W.O.B.H.M. with Max Bacon. 1984 Check video! Great stuff , just can’t get enough of it , they don’t make em like they used too ! great melodic sense, real power, a lot of dynamics, and a sound that is purely their own. I would describe this as “pop-NWOBHM” in the vein of Tobruk. It has that gigantic, 80s style production, big keyboards and some heaviness. Songs are well-executed (and with loud) pop hooks, all the so-called “glam metal” bands that dominated MTV back in the day pale in comparison. Bombastic, larger than life choruses, with great background vocals (which is something that I always value highly in a band). All kind of gels into a cohesive whole – aided in large part by the production, and everything is competent, this comes recommended. Bronz were really GOLD with this one should of been PLATINUM Maxs vocal ability was superb to say the least? Should be on any serious music lovers playlist. What a classic 7″; was tough to find. If you have heard it then you probably already have it. great choice! I really liked the Dennis DeYoung type vocals and the songs are great. “Send Down an Angel” is an incredible song. Fantastic release that stands shoulder-to-shoulder with such classics as Lionheart’s and Orion the Hunter (both from 1984). Max Bacon’s finest hour and an excellent vehicle for his high-reaching vocals. The brillance of “Send Down an Angel” has only been echoed a few times since this release… notably by bands like Shy, TNT, Masquerade and Steelheart. Max Bacon is as excellent as ever and ‘Send Down An Angel’ is definitely the best song on show. SEND DOWN AN ANGEL was a great song, sounds awesome. Of the songs, album opener ‘Send Down An Angel’ is a nice piece of pomp, with strutting piano lines and keyboard layers a la Grand Prix. Very well produced and very original sound, there is no mistaking this BRONZ’s sound. Has been my favorite band since the early 80’s. Gem of a record. Any real 80’s rock fan won’t hesitate to buy this unique rock band. MAX’S VOCALS SUPERB, AS USUAL. Of course, “Send Down An Angel” is marvelous… AOR with some Pomp Rock here and there. I love Max Bacon’s voice. After an early tie up with Dave Panton as their part-time manager in 1980, the band played many support slots at The Marquee and Music Machine with Angel Witch, More, Diamond Head, and Anvil. The band reappeared in 1983, with Goulstone on guitar and keyboards, Shaun Kirkpatrick on guitar and backing vocals, Clive Deamer on drums, plus Paul Webb on bass guitar and vocals. They were signed to an independent record label, Bronze Records. The band recorded Taken by Storm with Ritchie Cordell and Glen Kolotkin, later helped by Gerry Bron and Mark Dearnly on production. They were launched onto the US market via a tie-in between Bronze Records and Island. The line-up, then based in London, consisted of ex-Nightwing vocalist Max Bacon, Goulstone, Kirkpatrick, Webb and new drummer Carl Matthews. In 1998, an album of unreleased tracks from that time, entitled Unfinished Business was released. Following the demise of Bronze Records and original line up in 1984, after a major US tour supporting Ratt, Kirkpatrick assembled a completely new line-up. 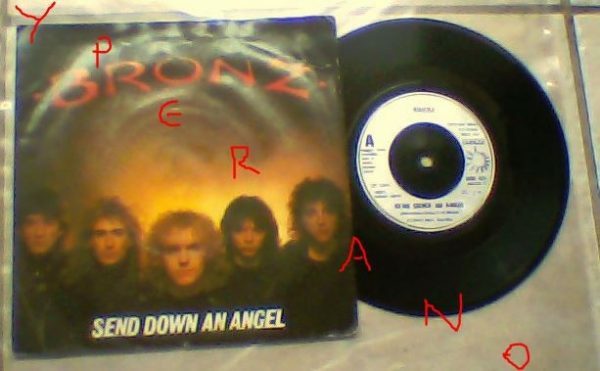 With producer Max Norman they created their second album, Carried by the Storm, which was recorded in Lonhttps://yperano.com/product/bronz-taken-by-storm-lp-different-us-version-different-artwork-album-cover-check-videos/dons Roundhouse and Power Plant recording studios. The band then comprised Kirkpatrick (guitars / Roland guitar synthesizer), Ian Baker (lead vocals), Mickey O’Donoghue (guitar), Clive Edwards (drums), and Lee Reddings (bass). Guest musicians included Phil Lanzon, Chris Thompson, Stevie Lange, Gary Barnacle and Charlie McCracken. During the final recording and completion of the album, the record label went into receivership, and until 2010 Carried by the Storm remained unreleased. 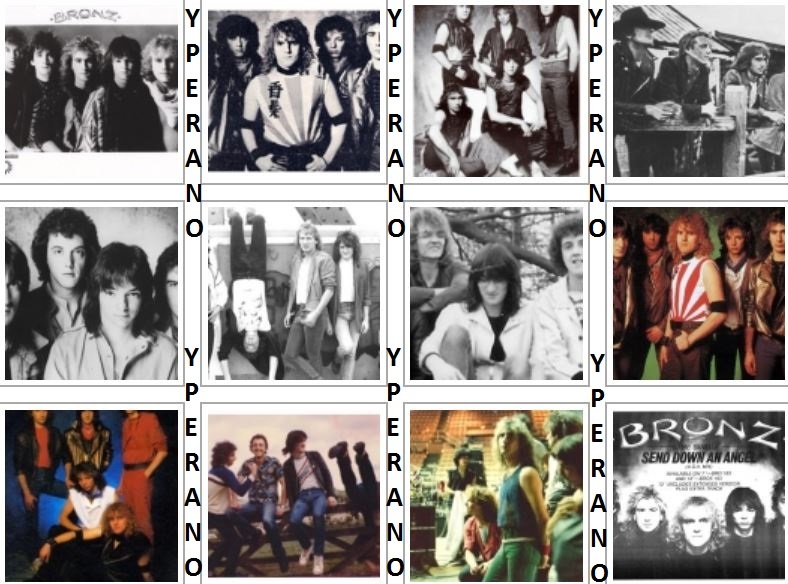 SKU: YP-4961 Categories: All Genres, AOR, Hard Rock, NWOBHM, Search by Media Type, 7", NWOBHM 7"